I have written a bit here about our first leaser car the Nissan Leaf, get ready for the stories about our second one, a 2017 Hyundai Ioniq Electric. It’s an interesting time in the automotive industry in general. When we got our all-electric Leaf in 2015 we were an absolute oddity, and it looked the part too. In fact it looked more like an oversized dust hoover than a car. A clear showoff vehicle, that turned the head of more than a few car nerds. Sometime in 2016 a neighbours friend was dropping by to show his new ride. A Ford Mustang, gorgeous! And he was looking at our car with awe.. a car whose acronym LEAF means “leading electric AFFORDABLE FAMILY” those are not keywords that attract your common power car enthusiast.. normally. Anyway, so now we have the Ioniq, and the differences are mainly how much more normal this vehicle is compared to the Leaf. Compared to the Nissan this car has a less premium feel in knobs and handles in the interior, made of the flimiest of plastics really. But that can easily be forgiven when you discover the range. The range of this thing is over 20km and its all due to the design being centered around efficiency. At the time of release it was the car – with any kind of engine – with the lowest drag coefficient. Better even than the upcoming much heralded Tesla model 3. In practice this means that it uses a lot less energy, making trips across the country not only feasible but a pure joy. In the Leaf the top speed was 90 km/h, anything over that and the range diminished dramatically. In the Ioniq 120 km/h is nothing at all and 130 km/h is going to limit the range but not in a way to make you nervous. For people not accustomed to electric car driving it is sufficient to say: electric cars now behave in a way you expect from a ICE (internal combustion engine) car. Business as usual. So with the basics out of the way let’s talk fancy stuff, adaptive cruise control and lane assist. These features are not from Hyundai but from an Israeli firm called Mobileye that sells this technology to many car makers, the lastest Nissan Leaf has the exact same feature set. In my car the Ioniq 2017, the adaptive cruise control uses several sensors, I think the chief one being a radar in the front, to get a sense of the traffic situation. If you have ever ridden a horse the net result is much the same. In the saddle a rider handles the duties of where to go, and how fast. The rider can however count on the horse staying on the general path without help and the horse doesn’t blindly charge into a tree or a horse in front of it either. 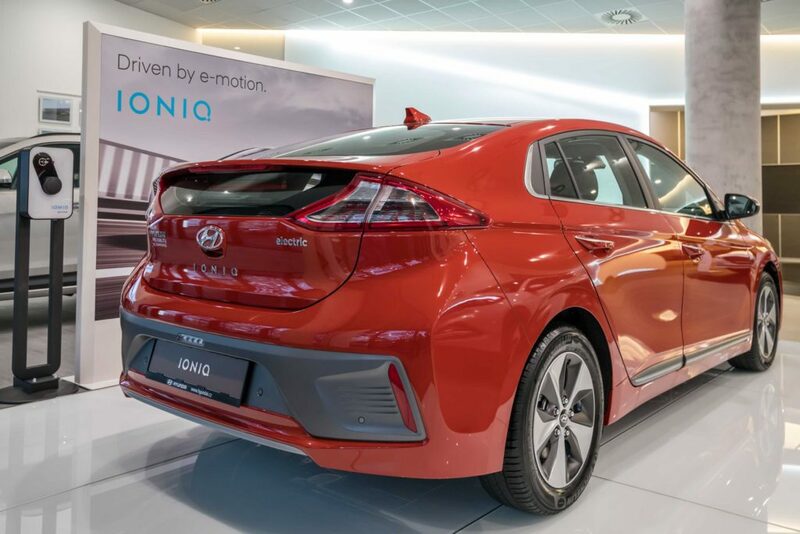 The brain in the Ioniq interpreting the traffic situation is very good, you dial in the general speed at which you want to be travelling and then it adapts the speed to the traffic around it. If the car in front of you brakes unexpectedly my car brakes exactly at the same time. If the car thinks a traffic accident is a possibility a little warning light and sound comes up on the dashboard with the text “Look out in front”. Solid advice for anyone driving a car 😀 I really wish there was some kind of display of how the Ioniq brains works because this feature borders on the uncanny. In one situation it correctly predicted that a huge garbagetruck was about to make a u-turn across my lane “look out for parked vehicle”. In another situation is slowed to a crawl to make a safe (safer than I would have done it) passage of two joggers on either side of a narrow road. My favourite example is when I wanted to pass a combine harvester headed from field to farm on a double – laned stretch of road. You normally overtake vehicles just by changing lanes, the adaptive cruise control then accelerates when it detects the coast is clear. Not so this time. I was well clear of the side of the harvester but the car steadily maintained a respectable distance from the assembly of steel in front of us. I could hear its little brain going.. NOPE! If you think I’m giving too much credit to this system I can tell you this car already exists in a completely self-driving version. I grade this system 9/10 for being absolutely 100% percent better at what it does than any human driver. Insurance companies should soon going to lower their premius for cars with this feature. For the benefit of the reader I have also involuntarily tested not only the early collision warning system but also the auto-brake system proper. It was entirely my own fault, me and the car in front were headed out from an intersection and when I thought he was going to accelerate he instead inexplicably slams the breaks, I was too close and all I had time for was realizing I was not going to be able to stop before touching his rear bumper. Turns out however that there was still time for the automated system. In an impossibly short amount of time it managed to fire two sets of warnings about impending frontal collision and then it stopped the car in time. I don’t think the driver in front of me even noticed because he just drove on. I grade this system 8/10 for being technically fantastic, but points are deduced for not being clear enough to the driver that an automated system just saved the drivers bacon. The reptile-quick event passes just as fast as it appears. There should be a shaming message left on the display. As mentioned above, our good friends the horses need no guiding hand to trot along known forest paths, and neither does the Ioniq on a well marked piece of road. This feature uses a front mounted camera to look for road markings and adjusts the steering wheel to keep the vehicle centered on the road. For most highways it works very well and if you feel you have lived a life without regrets you CAN jam a small bottle of water into the steering wheel to trick it into thinking your hands are still resting on it and have a 100% autonomous high-way driving car. But it is just not good enough yet, and Hyundai in its wisdom has built this system so that it turns off at any time and without warning if the road becomes hard to read. Hence the name “lane ASSIST”. This feature boosts confidence since it works even in heavy rain or even dense fog somehow which lets you drive just a little bit faster than you would otherwise have dared. The swedish snow covering the side of the roads does defeat it tho, giving you yet another reason to steer south during our long winters. Grade 6/10 a nice feature when it works but for the love of god don’t rely on its services. 14 Jan This entry was written by Martin, posted on January 14, 2018 at 5:31 pm, filed under Electric car. Bookmark the permalink. Follow any comments here with the RSS feed for this post. Both comments and trackbacks are currently closed.